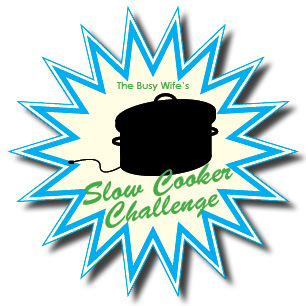 The slow cooker challenge has begun! If you missed my previous post and would like to join in, it’s never too late. Just go here to check out the details. 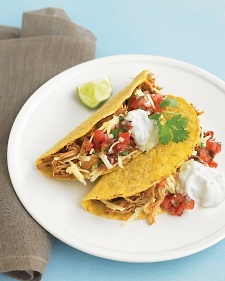 My recipe for this week is a one that I’ve made a few times before and even shared on my blog previously: Martha Stewart’s Slow-Cooker Chicken Tacos. I meant to take pictures, but was famished after bouncing around in Zumba class for a hour and just wanted to shovel the tacos in my mouth – hence the whole reason for the challenge: quick dinners after Zumba. But back to the recipe: it’s one of my favorites because the chicken comes out very moist and flavorful, and there’s always a lot of meat leftover that I can repurpose. I cooked the taco meat on Wednesday, and we had tacos for dinner; then Thursday, I made burritos. We still have some chicken leftover, so we will probably have tacos again for lunch tomorrow. Other ideas for using the leftover chicken include chicken tortilla soup, enchiladas, spicy chicken salad (the lettuce kind or the sandwich kind), chicken spaghetti, nachos, fried rice, barbeque sandwiches, taco pizza, taco soup, loaded potatoes, stuffed manicotti, white bean chili. Really I would use it for almost anything that called for chicken because I like the flavor. Combine everything except the shells and toppings in the slow cooker. Transfer chicken to a bowl and shred. Add some of the juice from the slow cooker to moisten. Serve with shells and toppings. My notes: I add water – just enough to cover the chicken. I’ve also swapped the chipotle chiles for enchilada sauce once (because I grabbed the wrong thing at the store); still fantastic. Add I usually end up using more chiles than called for (b/c what do you do with leftovers of those??). If you used your slow-cooker this week, what did you make?